This post is also going to focus on some wooden toys (because I love quality and wooden toys do appear to last better and longer...even with destructive toddlers!) that encourage children to interact with the toy. 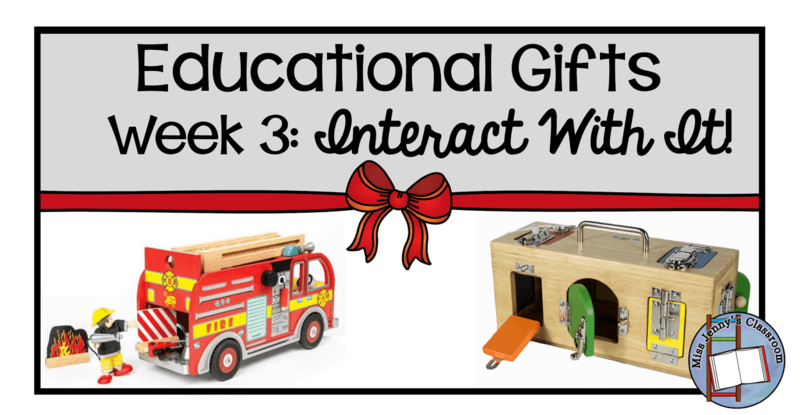 Welcome to Week 3 of the Education Gifts series...time is flying by! I actually purchased two of these when I first started working with young children...that was about 7 years ago - my version actually had animals painted inside the doors which was rather cute. My own children started investigating these at about 9 months...mostly opening and closing the doors they could open. This worked up to be able to manipulate the different locks and latches (which might be why my two learned how to open the front door very early on...). When I used these in a grade 1/2 class I found they were just as fascinated with the box as younger children. 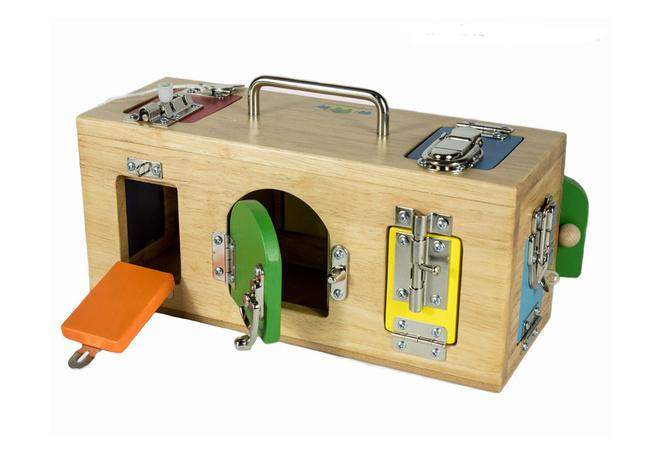 I feel this is a great choice for children who like to fiddle with things, investigate, manipulate, recall, and solve. Good for both boys and girls. Okay, any parent who has ever had a toddler has probably owned at least one of these guys. My kids had a bumble bee and a ladybird and for 12 months at least they would run around the house with their toy "clickety-clattering" behind them. Yes, the noise can grate the nerves just a little bit...but boy my kids thought these were the best toys ever! I mean who doesn't love running around making lots of noise. On the upside parents - you'll know where your little one is at all times just by the noise they make...sure you can get ones you just pull along but where's the fun in being quiet all the time. 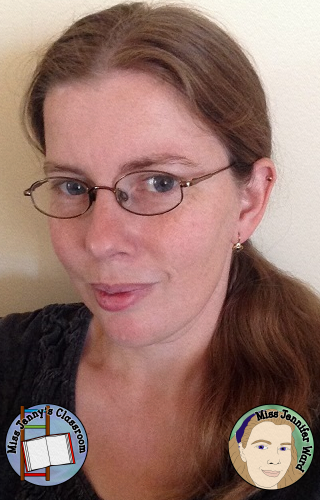 I really liked the look of this one. I has the sections to allow for greater movement - though I'm not sure if the positioning of them means it won't be noisy...but my son liked the look of it (has "big teeth" - really into "big teeth" creatures at the moment). So going by my 3 1/2 year olds recommendation - the crocodile is a winner! There are a great range of toys available when it comes to trucks. Both my children like trucks and fire engines are the flavour at the moment. Every time we go past our local fire station the children count how many engines are in there. So it's no surprise we have a wooden fire truck! This is a really well made playset for the toddler age. I would recommend waiting until at least age 3 but I think you'll find this one will be a firm favourite for a while! 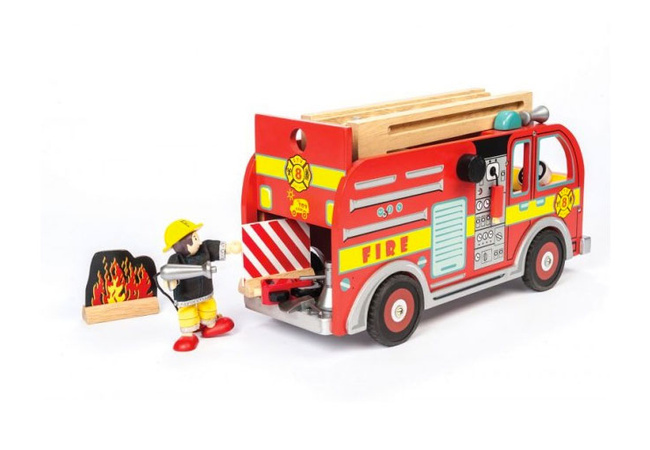 This toy encourages the "play thinking" when children start to talk to themselves, act out what they've seen (or watched if they're a Fireman Sam fan). It involves them opening and closing, moving elements back and forth, and talking about what they are doing - thus increasing their conversation and language skills. These toys have probably been around a lot longer than most of our great-grandparents but they continue because they're great. 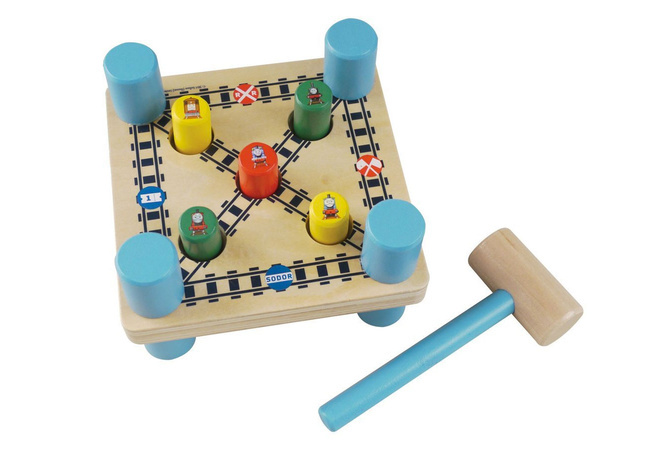 There are many different brands of peg hammering - mine has 9 coloured pegs in a rectangular shape but I saw this one and thought - my kids would adore it! (they're also going through a Thomas the Tank phase!). So what better way to build up coordination then with a wooden hammer and pegs - be mindful though - once my daughter was 3 she learnt how to hit the pegs completely out and they can be a bit of a pain to wiggle back in place! This Thomas and Friends one is a nice compact size featuring several of the engines. My kids love having me pick a colour and they hit it down so I can see that being expanded to stating the engine instead with this one! 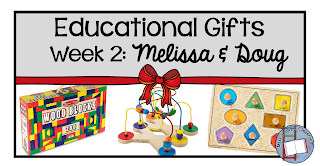 Stay tuned for Week 4's round-up of Educational Gifts next Saturday! Missed Week 2? Click the banner below. I love reading this series! While our son is now 12, toys like the ones you featured were some of our favorites for him when he was younger - especially since many of them reminded us of our own childhood! 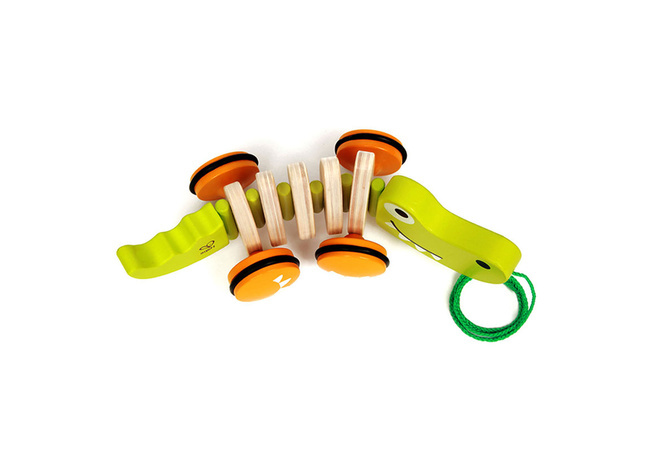 Thanks for refreshing our memories on these toys - they will be great ideas for our friend's young children who have upcoming birthdays(and Chriistmas, too! :)).